The right channel for profits! Media has proved beyond doubt that the pen is mightier than the sword. Good words, written or spoken, have an effective influence. A look at why retailers should recognise the power of media to employ it to their benefit. 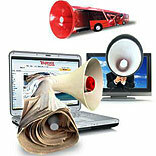 Newspapers, magazines, radio, television and the World Wide Web constitute a major part of the media. And as is known, these are far reaching mediums that convey messages across nations, boundaries and geographical limitations. This far-reaching characteristic of media is of a great use to businesses who wish to advertise and reach their customers across large distances, sometimes where conventional advertising tools like billboards and TV advertisements do not reach. “To make your Brand a household name, advertising on the radio is what you must be doing. The morning newspapers cannot be read while driving, whereas the Radio is always next to the consumer, so what are you waiting for…” This Radio advertisement, ironically so, I heard on my way to the office. The message could not have been clearer. Combining entertainment and information is what next level advertising on radio is all about. Reading large advertisements on the first page of a newspaper have become a very common sight now. Brands having their own websites to either advertise, inform or keep up with competition garner quite a lot of trust from consumers. An ‘Online Global Consumer’ survey by Nielsen Company conducted in July this year says 78 per cent of Indian Internet consumers trusted brand websites and in India the traditional forms of advertising are still ahead, like advertisements in newspapers and TV (77 and 76 per cent respectively). India has a very strong potential for the advertising market. This has been fuelled by the rapid rise in the retail sector during mid 2003, the IT and real estate boom. Despite a sharp cutback in advertising budgets due to the downturn earlier in the year, the advertising sector has since rebounded. Nielsen has projected a 28 per cent growth in this sector, which is backed by increasing advertising budgets of many national brands. That advertising is the key for brand success, is well known to most retailers. But making use of the media available, for advertising, is something that needs to be worked at. India is known to spend only one per cent of what the US spends on advertising, thereby revealing a large space for organised players to utilise to advertise their brand. Understanding this large potential of advertising in the Indian market, retailers need to be clever enough to choose the right medium to advertise. Not all Indian consumers trust mobile advertising as much as they trust newspapers, TV and radio advertisements. Retailers need to be tuned in to customer preferences when it comes to advertising and marketing strategies. The latest trend of national players to enter into tier II and tier III cities can only gain ground if the marketing strategy involves the local flavour, meaning thereby, the local medium of expression. It could be radio or door-to-door campaigns with flyers and brochures. For example, in tier II and tier III cities the medium of radio is very popular. Siddharth Bhardwaj, Regional Director (North-I) BIG 92.7 FM Chandigarh says, " Radio is an extremely local medium, which ensures high penetration while offering economic viability. It offers an excellent platform for local playerswho wish to target clearly defined local audiences." The significant factor here is the popularity and accessibility of the medium chosen by the retailer to market his brand. A lot will depend on the kind of medium chosen for advertising. The mileage afforded to a brand by successful advertising based on effective use of popular media, therefore, goes without saying. Another medium of advertising making its foray is internet marketing, although in India it is yet to make a significant impact. But going by the amount of time spent on the internet today, both by consumers and businesses, success through online advertising is also not far away, provided retailers turn their ears in this direction. The compelling power of media to create and influence ideas is something that every retailer needs to understand. How to make this power work for his profit is quite an art. Not only does he need to exercise his judgement in choosing the right medium for advertising, but also he needs to ensure his choice spells success for his brand.